The cost-effective Cisco IP Phone 7800 Series can help midsize to large enterprises meet their business needs with high-quality, full-featured voice communications. • Organizations that want to expand their investment in Cisco Unified Communications. Accelerate decision making with the addition of high-performance business video directly from your desk phone. 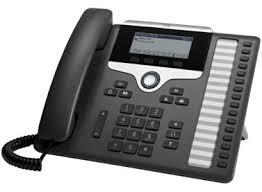 The Cisco Unified IP Phone 9900 Series delivers high-quality, interactive multimedia communications and advanced features in an elegant ergonomic design that is user - and eco-friendly. • Bluetooth 2.0 headsets add freedom at the desk. • Tri-color illuminated LED line/feature keys support at-a-glance status for primary and shared lines. • Reground and recyclable plastics. • Deep-Sleep power option reduces power consumption up to 90 percent in off-hours versus the phone in active state during the workday.